Sit back and relax on The Brbavica. 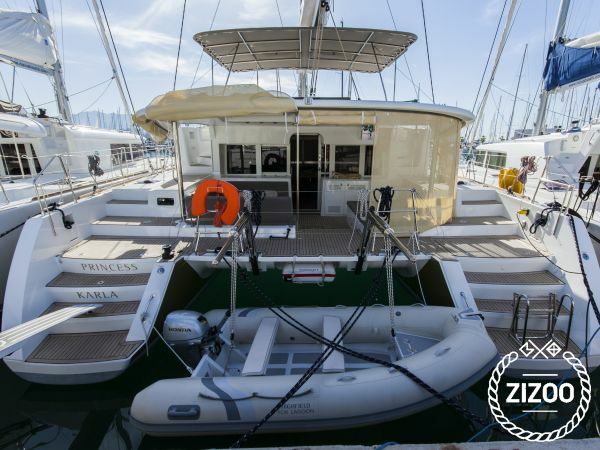 This 2011 Lagoon 450 anchored in Split offers a variety of options to both young and old, families and friends alike. With 4 cabins, a spacious salon, an efficient kitchen space and plenty of deck, this catamaran is made for a comfortable sailing adventure. Head north towards Zadar and experience the music of its wonderful sea organs. Walk around the old city and take in the smells and the sounds that make up its charm. If you're looking for a bit more action and fun, sail over to Zrce where youth, cocktails and very loud and thumping music will greet you. Or if you prefer a more relaxed atmosphere sail around the many little islands in the area and find a secluded beach reserved only for you. Of course, with all your questions and concerns you can contact the friendly crew who are there at your disposal. Zizoo helped with everything, thankyou. May in Split is really nice. Requested 77 times this week!